Move a rack up to the top third of the oven and preheat to 350 degrees. Lightly grease the donut pan. Whisk together the flour, baking powder, baking salt, salt, and sugar. In a small saucepan over medium-low heat, melt the butter until it begins to brown and smell nutty. Remove it from the heat, and transfer it to a small bowl to cool. In a separate bowl, whisk together the egg, buttermilk, and vanilla. Take 2 Tablespoons out of the browned butter and mix it in, too. Pour the wet ingredients into the dry ingredients. Mix them just until all of the flour is incorporated. Spoon the batter into the pan (fill each hole about 2/3 full), and smooth out each donut. Put in the oven and bake for 8-10 minutes, or when a toothpick comes out clean. Cool them for 5 minutes, and then invert them onto a wire rack. For the glaze, whisk together powdered sugar, cocoa powder, and salt. 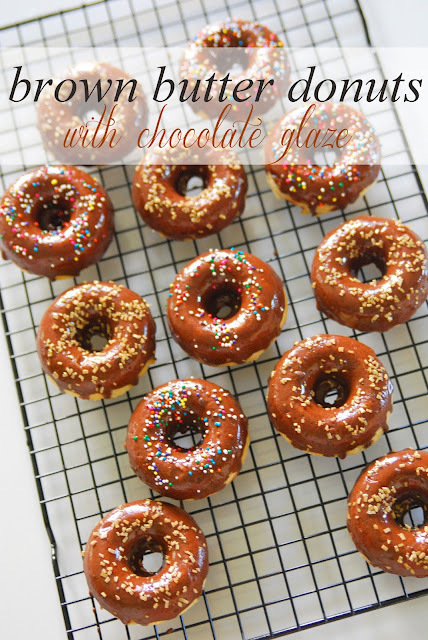 When they are cool, dip each donut into the chocolate glaze. Add sprinkles, and let the glaze harden a bit before serving. This recipe makes 6 regular-size donuts, or 12 mini donuts! Those donuts look so yummy and professionally made! oh my goodness! Hold on while I go out and buy a donut tray! Looks amazing!